Like a commercial kitchen with three chefs (executive, de cuisine, and pastry), or a perfect rock band (bassist/singer, lead guitar, and drummer), TOL tradesmen know how to work as a tight unit. 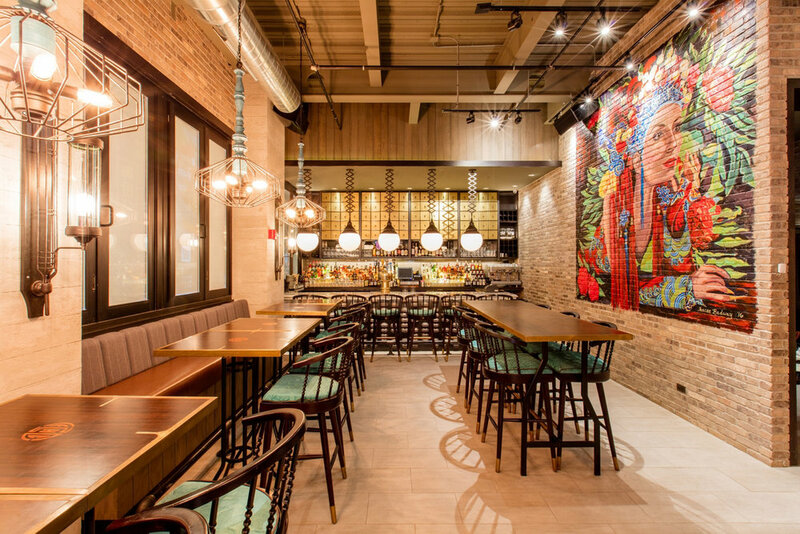 With a tight schedule and a set budget, Tree of Life Millwork's first project out of the gates was for what is now one of the most celebrated new restaurants in downtown Chicago, the Imperial Lamian. A great experience in collaborative teamwork. 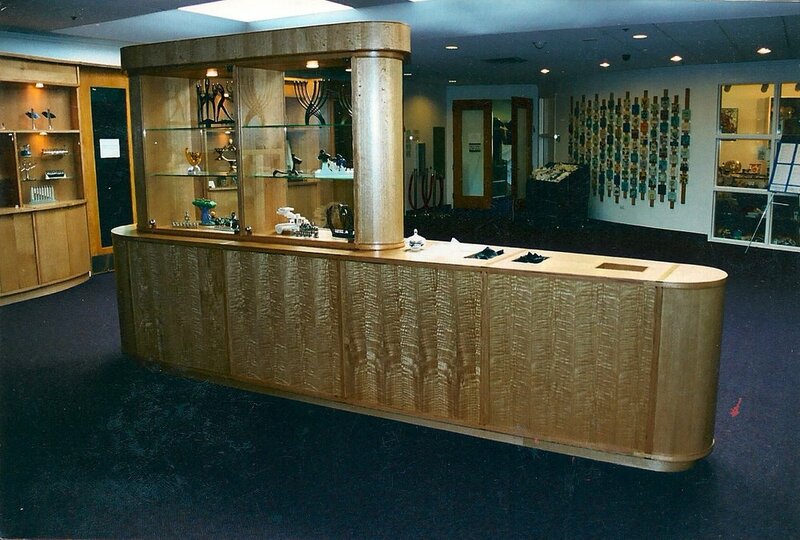 Tree of Life Millwork’s objective is to offer the ultimate collaboration experience with designers, builders, and individuals in the market for solid wood projects. You can expect fast bidding, easy consultation, specialized expertise, and curiously competitive pricing. This is just the beginning, the real magic happens when the woodworking begins. 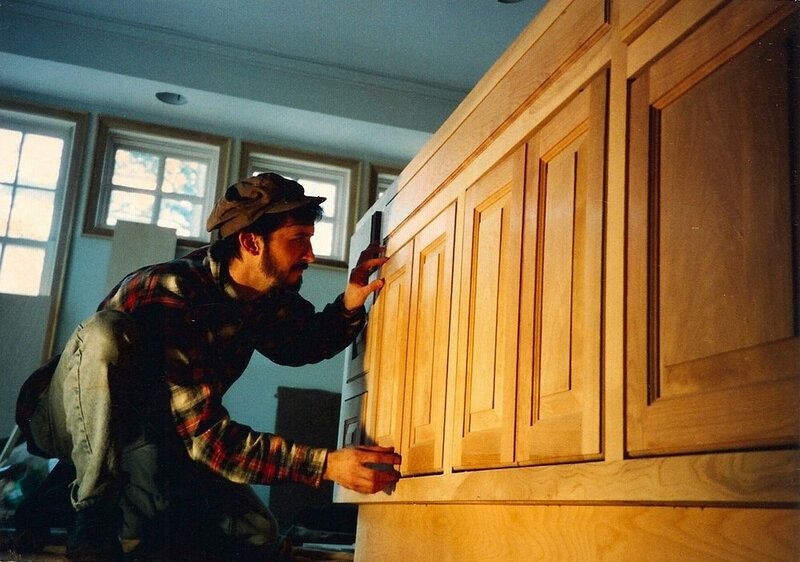 Combined, this small team of expert cabinet makers, millworkers, furniture makers, and finishers, have close to a hundred years of hard earned experience between them, and can handle almost any kind of project big or small. What separates Tree of Life Millwork from the competition is design experience and a willingness to be innovators in wood tectonics. They will freely offer their tasteful and technical ideas for your projects, plans, and proprietary ideas. Tree of Life is about getting together with all kinds of design partners and together achieving the best outcomes possible. They specialize in translating plans that often get spec’d with lesser materials and methods into timeless solid wood solutions that makes the work top shelf. This job was big, highly public, and on the tightest schedule imaginable. 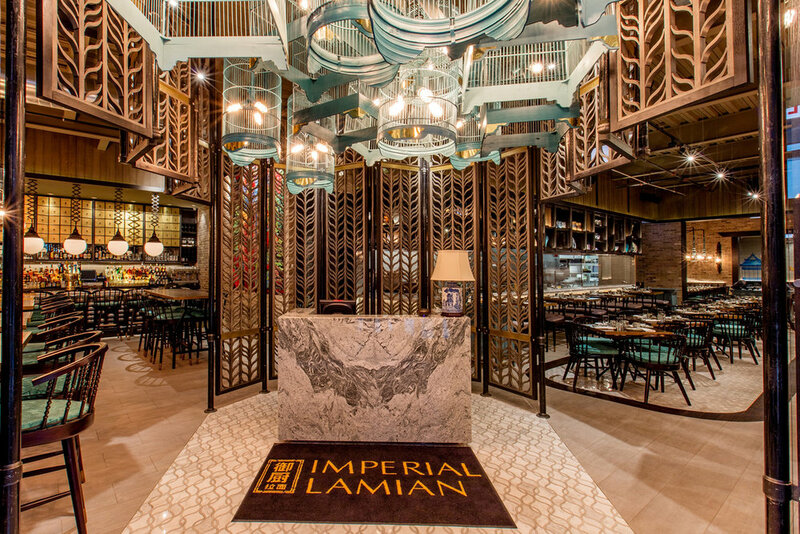 Tree of Life was commissioned to supply and instal close to $160,000 worth of millwork and cabinetry for the Imperial Lamian, in the heart of downtown Chicago, with only three months to make it happen. Tree of Life first consulted with a team of designers from Indonesia, contractors, subcontractors, and owners to offer the highest quality millwork they could. 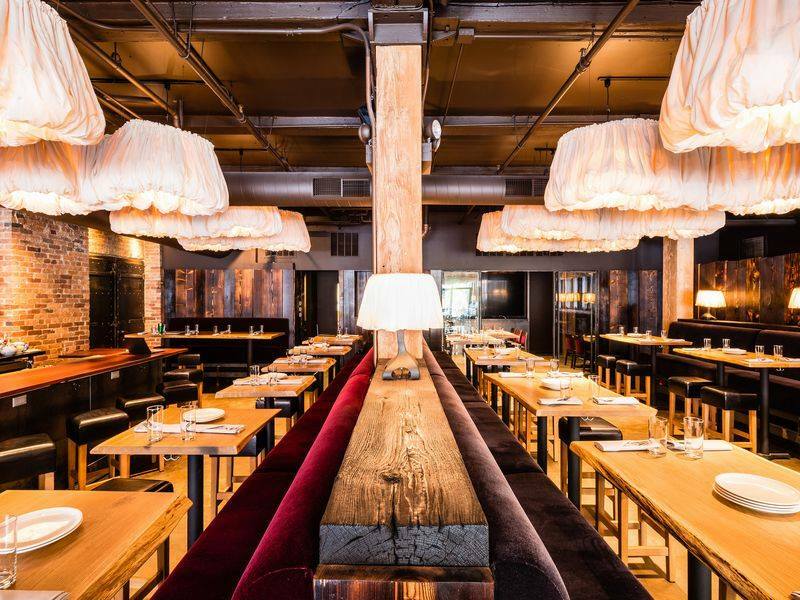 They convinced the designers at Metaphor Interior Architecture on certain changes that would make their project sing by moving away from CNC made MDF/veneer materials, and let TOL design solid wood solutions for the same price. There are examples of this through out the restaurant, including the suspended display cabinets, 12’ tall sliding doors, wall panelling, a marble clad reception desk, but the piece de resistance is the reception area ornamental screens. These screens included over four thousand individually hand made parts, all expertly lap jointed to their long slender stiles, and hung onto a custom fabricated steel super structure. To start, we select our materials with sustainability in mind, using them where and when they make the most sense. Steel for structure, lightness, and durability; solid hardwood for as much as possible for soulfulness and heirloom longevity; wood veneer core plywood for control of wood movement. All of the plywoods used by TOL are CARB compliant (formaldehyde free with no off-gassing). We do not use fiberboard, melamine, or particleboard. All of our hardwoods are grown domestically and can be Forest Stewardship Council certified or reclaimed locally. Combine the best domestic/local lumber with master fine woodworkers and you are bound to be presented with insanely great work. Our dedication to our craft is essential to our sense of self, and our ability to feel good as human beings. Early on a decision was made that has stayed decided for twenty years, that by focusing on quality at all costs, everything else would work itself out. Some projects have been profitable, while others not so much, but the work is always the same. John Lindsay has been a professional woodworker, design builder, and an entrepreneur for over twenty years. His ambition for Tree of Life is to represent leading artisanal craft on an industrial level. John divides himself between his two companies, the first with a focus on custom cabinetry and millwork, his bread and butter, supporting him and his family as he pursues his micro architectural vision with his second company, New Breed Furniture. 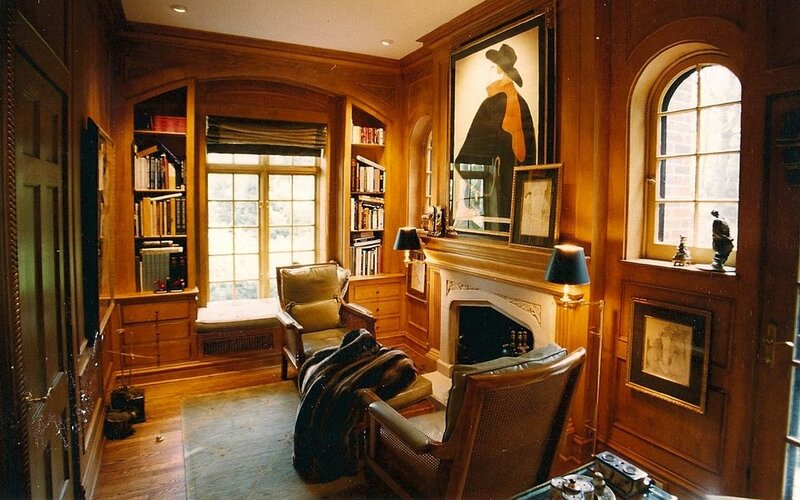 Ed Duchemin has been a high end cabinetmaker and millworker for close to forty years, having built commercial projects that would impress any millworker on the planet. Ed is a woodworking lifer, making numerous sacrifices to continue developing his craft. For Ed, it’s a quality of life issue, for him working with his hands, with materials he loves, and building projects that afford the kind of quality seldom seen in most shops is a priority. Ed and John have an easy collaborative relationship that stems from a mutual respect that has been earned building together. Rudy Pavletic has worked in the cabinetry and finish industry for more years than he cares to remember. He currently works as a freelance finisher for a number of cabinetry and millwork companies in the Kenosha/Racine area, but his real home is at 6126 14th Ave, working with John and Ed. He takes great care seeing all the work is properly final sanded and prepared before applying the best finishes from our preferred local finish supplier. General Finishes, in Beloit WI, offers the highest quality and the most environmentally friendly finish on the market. What signaled John to jump back into the ring, and jump start Tree of Life again was an opportunity to build three dozen table tops out of a white oak tree that had been felled in Winnetka IL. 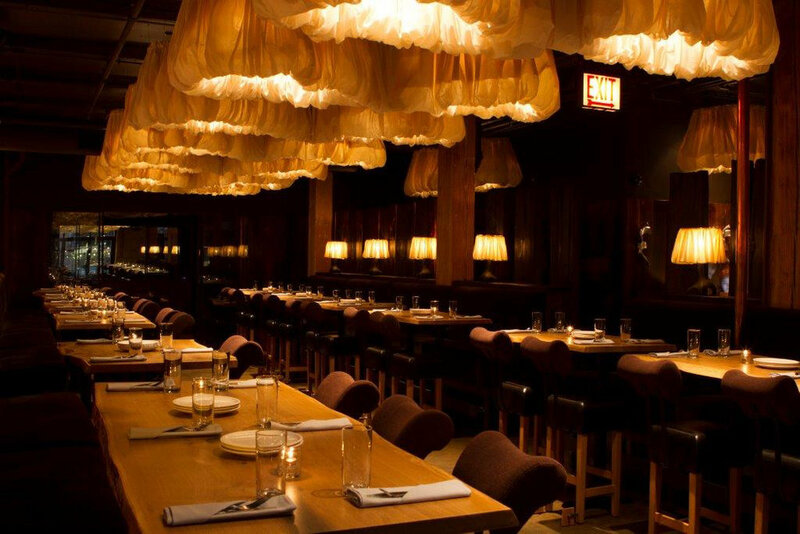 This project was the first for the celebrated restaurant designer Jordan Mozer. That restaurant has a name any woodworker would love, Oak and Char. Since then Tree of Life has worked with other companies like Benjamin West in Milwaukee and Larry Vodak from Scout in Chicago, but their most regular and fruitful collaboration as a vendor has been with Icon Modern, Chicago's King Kong of all things locally sourced, reclaimed, and feel good. You've probably seen their work with corporate clients such as Starbucks, Whole Foods, and Google. They were early supporters and the first commercial representatives of New Breed Furniture Network, TOL’s founder's second company. Now, having a productive business to business relationship and being able to meet Icon Modern’s exacting standards is a badge of pride and proof of Tree of Life's competitiveness and professionalism. Tree of Life can source, fabricate, and finish a wide selection of solid wood tops (slab or joined / live edge or square edge), doors, stair treads, trusses, cladding, panelling, trim packages, and even flooring made from the most environmentally respectable suppliers. They take pride in crafting interesting materials into new and beautiful furnishings and spaces. Salvaged pieces, knotted and quirky wood grains all present a welcomed challenge, the possibility of a one-of-a-kind piece, brought to life by the material’s natural characteristics. As a customer, you can know that Tree of Life will take the time to properly lay out, sequence, and join your solid products with an artist’s dedication to beauty. The most fulfilling of all the custom cabinetry projects Tree of Life has built over the years was for the Biela family, in Lake Forest IL. There is no better example of design dignity and customer collaboration I know of. They had a very specific need, separate their living and dining spaces, with each side of the work dedicated to each use Tree of Life designed the perfect solution using its Cubis Cabinetry System. Using solid wood connectors on all edges, full inset doors, and solid wood rail and stile doors, sometimes with laminated frosted panels that let the concealed puck lighting shine through, the final product exceeded all expectations . To guarantee all around excellence, Tree of Life offers free design services, that’s right, we design for free. We earn our living as woodworkers only. The difference between our design services and others are threefold. 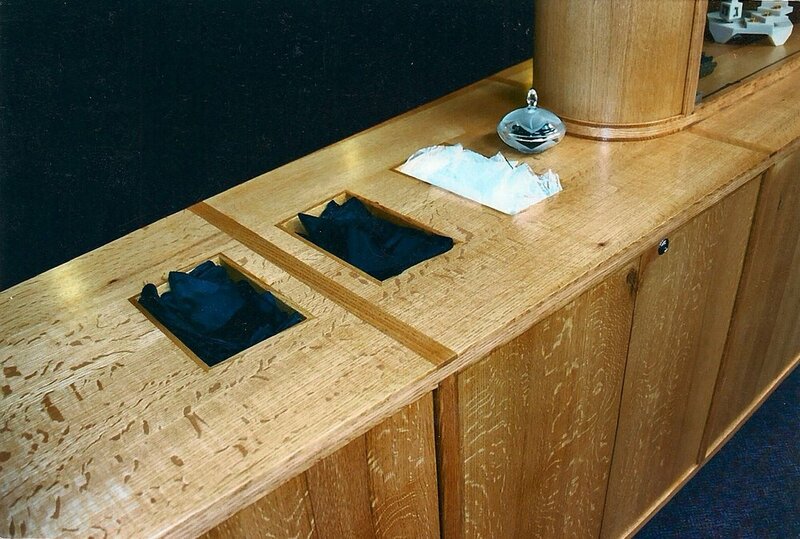 First, we understand what wood likes to do, and what it doesn’t like to do which makes for better designs. Second, we can tell you what all the designs and their changes cost, super quick, good for needed value engineering. Finally, by working direct with the builder/designer, our pricing is insanely competitive. 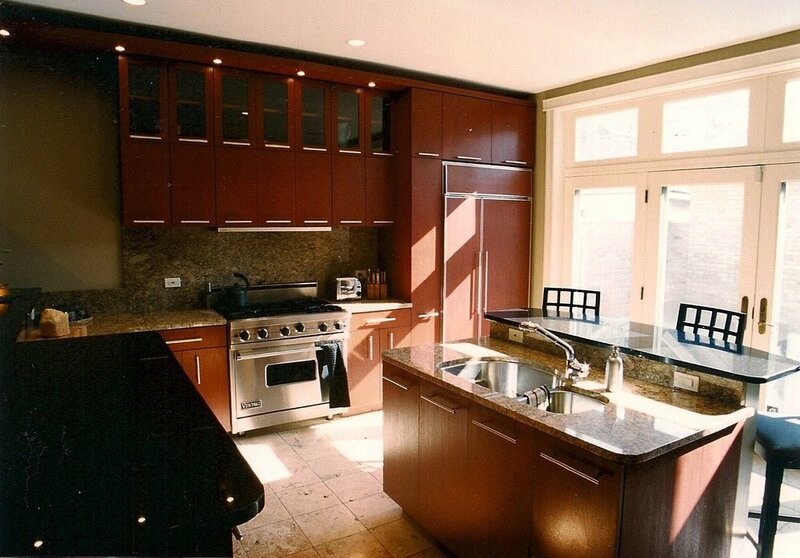 The latest full service / turnkey project was for a family in Northbrook IL, the Goldfarbs. For their new construction house, TOL's scope included a state of the art kitchen, pantry, fireplace elements, and master bathroom cabinetry. 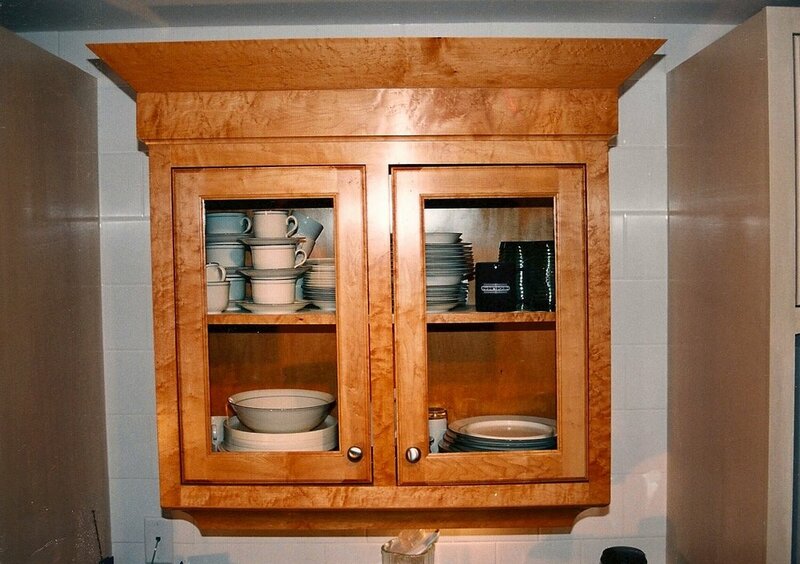 Tree of Life developed a whole new approach with the Half Breed Cabinetry System. Inspired by John’s New Breed Furniture, Half Breed features a variation of the aluminum/solid wood handle found in the Petalply Series, but beefs it up for more heavy duty uses, and plays with different applications like its horizontal doubling runs, perpendicular terminations, and its split square center grip. Tree of Life was born in the hey day of the booming nineteen nineties, with a rocking economy, and thank God for that because how else would an upstart woodworking company cut its teeth? During those years Tree of Life was willing to be a hired gun that could build in any wood working style or tradition. Over time, some languages became more the mother tongue than others. Tree of Life Millwork represents 21st century design, with a love of mid-century modernists, and a reverence for other older traditions like arts and crafts, mission, and shaker, with the deepest respect for the traditional Japanese residential world. Tree of Life Millwork has paid its dues as both technical fabricators and innovative designers, and is now ready to make their expertise work for you.